Three days before the Great Eclipse, during a heavy storm, your grandfather and chief wizard, Ohkram, knocks on your door. The Kingdom of the Blue Rocks is in danger. Ten years ago, Ohkram banished the evil wizard Kraal. Now Kraal is out for vengeance and wants to reign over the kingdom. Ohkram has become too old to stop Kraal and turns to you, Ween, to find the hourglass of power, Revuss, and fulfill the prophecy to destroy Kraal once and for all. To do so, Ween needs to pass three challenges: he must remove the seal which guards the entrance to the cave temple, he must defeat the dragon with a hundred faces, and he must convince the guardian to open the entrance to the sanctuary in which the Revuss is protected. After each challenge he will receive one grain of sand. But time is short - if the three grains of sand are not placed in the Revuss within 3 days, Kraal will rule all. The Prophecy, also known as "Ween: The Prophecy", was designed by Coktel Vision and created by Joseph Kluytmans. Like most Coktel Vision adventure games, The Prophecy uses the Gob engine and features very hard and often illogical puzzles, requiring lots of trial and error, making it best suitable for the more experienced adventure gamers. 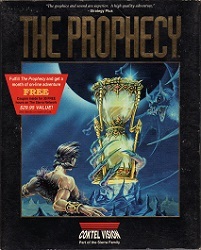 Although the ending hints at a possible sequel, The Prophecy remained a single title.